This recipe is such a classic family friendly dinner. 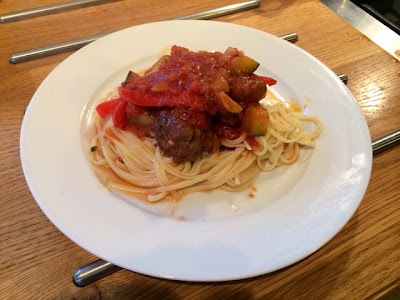 Kids love spaghetti, kids love meatballs, if they’re fussy about veggies you can blend up the sauce to hide them, and the flavours are so delicious we all still love this dish as adults. 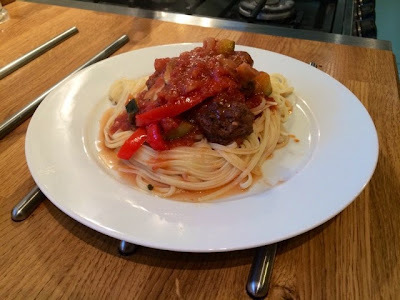 This is a great recipe to use for midweek dinners as well because it’s so quick and easy, particularly if you’re using meatballs you’ve already prepared or bought some ready made ones. Top tip: make a batch of meatballs when you have plenty of time at the weekend, brown them off in a frying pan, but don’t cook them through, leave them to cool and freeze them. 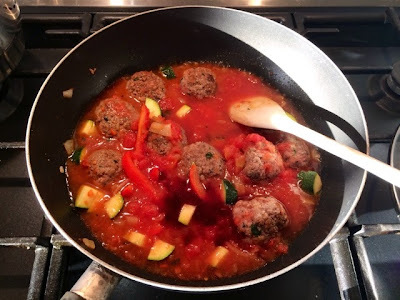 This way you can get a few meatballs out to defrost in the morning and in the evening after work they can just be dropped into your sauce to finish off cooking. This saves you all the time and effort of assembling the meatballs and browning them off and means you can knock this dish up mid-week in well under half an hour and made entirely from scratch. 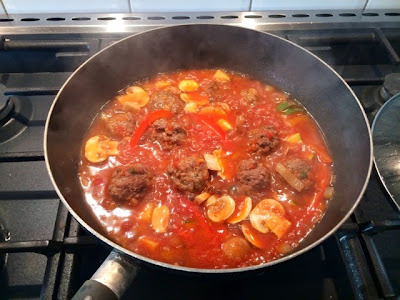 *Note: I used part cooked meatballs, if you are using uncooked meatballs brown them first and then continue with this recipe. 1. Heat a little oil in the pan on a medium heat. 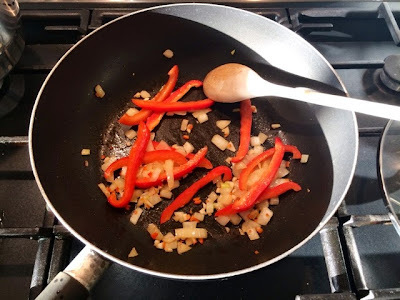 Add the onion, garlic, chilli and pepper. Fry until onions have softened. 2. 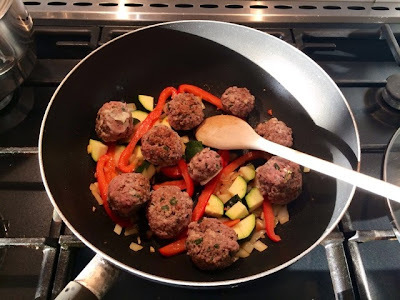 Add the meatballs, the courgette and the sun dried tomato puree and fry for a further 2-3 minutes. 3. Pour in the chopped tomatoes, refill half the carton/tin with water and throw that in too. Add the red wine and the paprika and chilli flakes. Stir through and bring to the boil. 4. Reduce to a simmer and cover. Leave for 15 minutes. 5. Add the mushrooms and leave uncovered, simmering gently allowing the sauce to reduce while you cook the spaghetti. 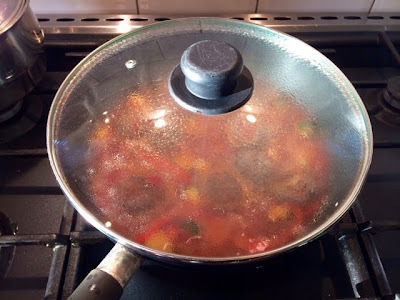 If your sauce has already thickened to a good consistency then leave covered, if it’s too thick then add a splash of water to loosen up. 6. Cook the spaghetti according to packet instructions. 7. 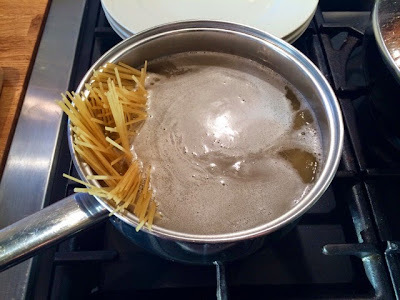 Drain the spaghetti and divide equally between three plates. Spoon 3-4 meatballs onto each plate and spoon plenty of the veg and sauce on top.